Wondering how to select a field marker? Want to know what kind of paint is best for your field? Need to know how to mark or paint your field? Get answers to common field marking questions below. Just click on a question and its answer will expand below. Still have questions? No problem! Give us a call or sign up for our newsletter, to get the answers you need now. What is Tru Mark's Terrain Following Paint Shield Assembly technology? Tru Mark's Terrain Following Paint Shield Assembly technology ensures a crisp and even width paint line no matter the terrain. The paint shoe shields are mounted on a rotating rod that does not over rotate when field marking unit is tipped yet can be rotated using a handle bar control cable assembly. The shield width spacing is adjustable for different line widths. The shields minimize drift during windy conditions. The rotating design ensures there are no parallel lines at the completion of line striping due to over spray and dripping/brushing off from the paint shields. This technology was developed in 1995 and continues to endure the Tru Mark distinctive line striping brand. Why is acrylic latex paint better? Acrylic paint is fast-drying paint containing pigment suspended in an acrylic polymer emulsion. Acrylic paints can be diluted with water, but become water-resistant when dry. Most bulk latex field marking paints are formulated for dilution with water by the customer. Acrylics were first made commercially available in the 1950s. Water-based acrylic paints were subsequently sold as "latex" house paints, although acrylic dispersion uses no latex derived from a rubber tree. Over the years certain materials (or the lack of) have been found which will minimize the impact on natural turf. Click for Iowa State University bulk latex paint field test plot (2002). Paint consists of four basic elements, pigment, binder, solvent, and additives. Pigments are granular solids incorporated into the paint to contribute color, toughness or simply to reduce the cost of the paint. Pigments can be classified as either natural or synthetic types. Natural pigments include various clays, calcium carbonate, mica, silicas, and talcs. Synthetics would include engineered molecules, calcined clays, blanc fix, precipitated calcium carbonate, and synthetic silicas. Fillers are a special type of pigment that serve to thicken the film, support its structure and simply increase the volume of the paint. A commercially important pigment is titanium dioxide. Opacity is also improved by optimal sizing of the titanium dioxide particles. The binder, or resin, is the actual film forming component of paint. Binders include synthetic or natural resins such as acrylics, polyurethanes, polyesters, melamine resins, epoxy, or oils. Latex paint is a water-based dispersion of sub-micron polymer particles. The term "latex" in the context of paint simply means an aqueous dispersion; latex rubber (the sap of the rubber tree that has historically been called latex) is not an ingredient. Latex paints cure by a process called coalescence where first the water, and then the trace, or coalescing, solvent, evaporate and draw together and soften the latex binder particles and fuse them together into irreversibly bound networked structures, so that the paint will not redissolve in the solvent/water that originally carried it. Water is the main vehicle for water-based paints. Besides the three main categories of ingredients, paint can have a wide variety of miscellaneous additives, which are usually added in very small amounts and yet give a very significant effect on the product. Some examples include additives to modify surface tension, improve flow properties, improve the finished appearance, increase wet edge, improve pigment stability, impart antifreeze properties, control foaming, control skinning, etc. Tru Mark Premium Quality Field Marking Paints . Tru Mark field striping paint for synthetic/artificial and natural turf surfaces. Tru Mark Athletic Field Marker Model E-100 walk-behind athletic field marker has demonstrated the capability to apply acrylic latex traffic zone marking paints. This demonstrated capability adds a new opportunity for customers to use the E-100 as a 3-in-1 sprayer: field marking, traffic zone marking, and herbicide application. The 12-volt 3.3 gallons per minute electric pump supplies sufficient pressure and volume to one of the spray nozzles for a professional looking 4" line. The traffic zone marking paint was diluted with either 16 ounces of water or 16 ounces of latex paint conditioner to 1 gallon of paint. What field marking paints have been tested? 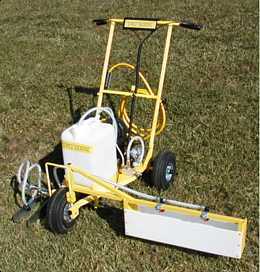 The Tru Mark Athletic Field Marker Model E-100 with optional Paint Boom was demonstrated at the annual 2002 Iowa Turfgrass Field Day, July 18, 2002. The Paint Boom, a two nozzle sprayer in a fixed 24" paint box, is a cost effective method of applying hash marks, block letter and lining. Dale Roe, ISU Athletic Field Maintenance Supervisor stated, "the E-100 Paint Boom design provides a easy and quick method of lining hash marks and block lettering." 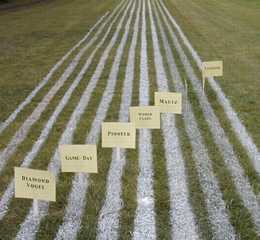 The Iowa State University personnel established a test plot of different athletic field marking paints. The most striking test plot was a comparison of two growth inhibitors and a control set of field marking lines. In addition, a ISU football Big 12 stencil application was presented. A picture highlights basically three categories of athletic field paints. The field marking paints were applied 4 days before event, using a 1 to 1 ratio of water to paint. Dale Roe applied these different paints using a one nozzle field marker. The photo shows that the World Class and Mautz field paints as the most distinctive while Fastliner and Pioneer field paints were in the second category. The test plot shows a noticeable difference between the use of a growth inhibitor applied as part of the field lining activity. The three set of lines on the left is with a 1 oz. Primo application to 1 gallon of diluted field paint. The next set of three lines is with a 1/2 oz. of Primo and the center set of three lines is the control group without an y growth inhibitor. The far right set of three lines is applied using 1 oz. Embark and the next set of three from the left is with 1/2 oz. of Embark to 1 gallon of diluted paint. The test plot was painted on June 28th, three weeks before the field day. It shows that with a growth inhibitor you can reduce the number of times you line strip for field areas without a lot of wear, e.g., soccer, band, and baseball. Dale Roe stated that they typically apply Primo at a 1 oz. rate three times a season to reduce the number of stripping applications while maintaining quality looking lines on their practice fields. Dr. Dave Minner explained the ISU stencil procedures for football field applications. The whole area of the stencil is painted a week before the event with Primo. The outline of the stencil is made aerosol cans. Then the initial stencil is painted using a 3 to 1 ratio of water to paint. A second pass with a lower dilution factor is applied with Primo normally the day before the game. For end zone stripping they cut the end zones 1/4" to 1/3" shorter than the rest of the field on Tuesday or Wednesday, then paint using Primo, and then again mow the morning of game day. Cutting the grass shorter earlier in the week along with using the growth inhibitor doesn't cause the paint markings to be mowed off later in the week. Determine how many linear feet of striping is needed. Measure the length of each line and total all segments of the respective lines (e.g., perimeter, internal lines, boxes, circles, etc.). For natural turf fields a rule of thumb we like to use is for every 250 linear feet of 4 inch line you will use approximately 1 gallon of diluted bulk latex field paint. For example if the dilution ratio for bulk latex field marking paint is one to one (1:1) or one gallon of water for every one gallon of paint then for a 250 linear feet of 4 inch line you need a 1/2 gallon of undiluted paint. Let's say that we are striping a soccer field that consists of 1500 linear feet. This then indicates that we need 6 gallons of diluted paint or 3 gallons of undiluted bulk latex paint that has a recommended dilution ratio of 1:1. For sports field stencils we recommend you plan for one gallon of diluted field marking paint for every 100 square feet of stencil area. For synthetic turf fields when using Tru Mark removable and permanent field marking paint such as Rally Day, Season Ticket, and Solar Trail which is typically not diluted we recommend a plan to cover 300-500 linear feet of 4 inch line for each gallon of paint. From our soccer field example above for 1500 linear feet of 4 inch line you should plan to use 3 gallons of synthetic/artificial turf paint. Tru Mark Trail Wash paint removal agent is diluted up to 1:1 up to 5:1 (water to agent) and should cover about 250 linear feet of 4 inch line per diluted gallon. Use Solar Trail diluted 1:1 for removal of the Solar Trail synthetic turf paint and other hard to remove material from the turf. When painting field stencils on synthetic turf we recommend a plan of one gallon of undiluted paint covering 100 square feet of turf. Consider our field painting strategies (50 KB Adobe .pdf file) tutorial to learn some of the tips and tricks of field striping. How many cans of paint do I need to line a field? How to make a Turf and Golf Course Divot Mix? Use a small cement mixer to mix your divot mix, first adding sand, water, and turf colorant, then adding the compost and letting the mixer coat all the material. Adjust the color and coverage by adding either more water or coloran. Once thoroughly mix then add you turf seed and mix well to help start the germination process. The colorant coated sand and compost blends in better with the the existing surrounding turf. Using field marking colorant will help you minimize environmental hazards and adverse affects to the germinating grass seed. The colorant holds up long enough for the grass to grow back in the filled in divot area. Where can I access service/operator manuals? The following documents are the Tru Mark Athletic Field Marker operations munuals that are provided at the time equipment delivery along with some helpful information on the field marking operations. Tru Mark's Trail Blazing blog . Learn about field painting and turf tips, sports turf industry trends and future trends impacting our local community. In addition, as we implement our blogging activities we are also posting images in our Photo Album. What are the football field marking requirements? What are the soccer field marking requirements? What are the lacrosse field marking requirements? What are the rugby field marking requirements? What are the Ultimate Frisbee field marking requirements? Are TruMark products manufactured in the USA? Yes. TruMark Athletic Field Markers are manufactured in Omaha, Nebraska, USA. They are built with parts supplied by American companies. TruMark will accept the return of your item in good operating condition, no damage, no use on fields, etc within 30 days of receipt. A restocking fee of 15% and the cost of the return shipment will be charged to the customer. Contact us prior to returning any goods to obtain return instructions. There are no returns or exchanges on custom orders. Yes! Send us the PO via email to info@trumarkathletics.com, place the order over the phone at 800-553-6275 or fax it to 707-276-1061 and we will process the order and invoice with net 30 terms. We accept checks or credit card payments. There are 3 easy ways to pay your bill: 1. Mail a check made out to TruMark Athletics to PO Box 451037 Omaha, NE 68145 2. Call us at 1-800-553-6275 and we can process a credit card payment over the phone. We accept Visa, MasterCard, American Express and Discover. 3. Pay your bill online. Under the "CONNECT" navigation click on Bill Pay. What kind of paint do Tru Mark Athletic Field Markers use? Can I run a herbicide, such as Round-Up, in my machine? As long as the herbicide is water based, and does not require chemicals to clean up, it is OK to run through the machine. Can I run a growth regulator, such as Primo or Embark, in my machine? Yes you can run a growth regulator in your Tru Mark field markers. Please ensure you follow the manufacturer's applications rate to prevent any turf damage. Visit our news release on the Iowa State University field test. What do you recommend when rinsing paint from your field sprayers? After emptying your paint tanks refill the tank(s) with 1-2 gallons of clear water. Run the pump(s) and flush all lines, including the spray wand if used. Empty the contaminated water (due to the agitation return line) from the tank(s) and add 1-2 gallons of clear water. During this second rinse cycle you may add a liquid blue product called Pump Protector, 1 to 2 ounces per gallon of water. Run the pump(s) to circulate the Pump Protector diluted solution for 10 to 20 seconds. This diluted solution may be left in the equipment. Pump Protector can be purchased from paint supply companies. This product helps keep any remaining paint in suspension and reduces the build up of paint on the internal lines, pumps, hoses, screens and spraying nozzles. How difficult is it to repair a 12-Volt diaphragm pump? Two of the great advantages of using a 12-Volt diaphragm pump technology in field marking operations are the relative ease and low cost of maintenance. Refer to a more indepth description of the technology with photo album . What is the comparison between Models E-100 and EZ-70? What is the cost comparison between aerosol sprayers & Tru Mark? Aerosol cans figured in bulk at $32.00 a case. Tru Mark paint figured at $7.00 per gallon of concentrate. Assuming a small club with 4 fields, using aerosol paint consumes (1) case of 12 cans per field, going over the lines twice, for a cost of $32.00 per field. Allowing for an 8 week season in the summer and an 8 week season in the fall, applying only 4 weeks out of each season, the cost comes to $512 per season, not including tournaments. Add 50% to the cost for tournaments and weekly touch up, and the cost goes to $768 per season, or $1,536 per year. A small club with 4 fields using a Tru Mark Athletic Field Marker consumes 3 gallons of concentrate maximum per field, going over the lines once (and getting better coverage than twice over with aerosol), for a cost of $21.00 per field. Figuring an 8 week season in the summer and an 8 week season in the fall, applying only 4 weeks out of each season, the cost comes to $336 per season, not including tournaments. Add 50% to the cost for tournaments, etc., and the cost goes to $504 per season, or $1,008 per year, for a savings of $528.00. The hidden costs that are not defined in the above comparison include your time to make a double pass over with aerosol, the cost of defective aerosol cans due to plugging, and the cost of proper disposal of empty aerosol cans. The Tru Mark Athletic Field Marker will provide you with distinct line quality, economic field maintenance, safety and simplicity. How long can I spray before needing to recharge? The Model E-100 is able to spray for a full day on one charge of the battery. At the end of the day, just plug in the battery to the battery charger (included) and the charger will trickle charge the battery to a full charge. What kind of battery do I use? The Tru Mark Model E-100 is designed to run on a 12-volt Group 24 deep cycle marine battery. We recommend a 650 or greater cold cranking amp (CCA) rated battery. A regular car battery should not be used because they are not designed to be run down and charged back up in the manner the marine battery is. Is the battery included with the machine? No. The battery can be purchased almost anywhere batteries are sold. Can I use Tru Mark equipment to mark parking lots? 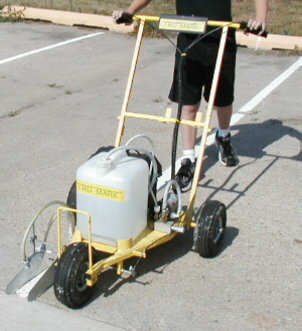 The Tru Mark E-100 can be used with water-based zone marking paints. To use zone marking paint or acrylic latex paint used for parking lot marking you must plug the front nozzle of the spray head with a solid disc spacer. Remove the current spray nozzle and flow control value with multi-purpose wrench and replace it with the spacer. The paint should be diluted 16 ounces of water or 16 ounces of latex paint conditioner for every gallon of paint used. You may or may not need to adjust the restriction plug set screw in the paint return line. Adjust the spray head to achieve your desired line stripe width. Since there may be slight paint dribble when disengaging the right handlebar control, it is recommended to reverse your direction for 6 to 12 inches so excess paint is applied to already painted section. What makes your machine better than your competitors? Simple design; ease of maintenance, simple clean up, no pressurized tanks to handle and maintain or gasoline engines to maintain; and user safe (because of the non-pressurized system). The three-wheel design makes it easier to go straight, and the 10" pneumatic tires make it easy to handle on the grass. What are the athletic field stencils made of? It depends on the stencil! The sideline number stencils and hash mark stencils are manufactured from durable 1/8" sheet plastic. The hashmark stencil has hinged sections for easy folding. The letter stencils and custom logo stencils are manufactured from 10 mil agricultural grade sheet plastic for durability, flexibility and easy storage by rolling or folding. What are the field stencil shipping weights? The 6' Sideline Number Stencils 1/8"' ship at 88 pounds in two boxes. The Hashmark stencil ships at 27 pounds. Large Block Letter Stencils (10' x 16') ship on average at 10 pounds per letter and vary between 8 and 12 pounds. Custom Field stencils will vary in weight depending on the size and the amount of material remaining after the manufacturing process. How much paint is needed for a field stencil? A rule of thumb for painting field stencils is approximately 1 gallon of diluted bulk paint per 100 square feet of stencil. For example a Large Block Letter stencil, 10' x 16', will have approximately 100 square feet of painted area. When using aerosol paint we would recommend 4 cans of aerosol paint per letter. If this is the first application you may use more and subsequent painting operations will likely use less paint. What is the width of the football Sideline Number stencils? The 6' tall football Sideline Number stencils will vary in width but are generally 42" to 44". How durable is the custom field and end zone stencil material? Our custom field stencils and large block letter stencils (10' x 16') are manufactured from 10 mil agricultural sheet plastic. The material is the toughest, very difficult to pierce, in the industry. It is more durable than a 10 mil industrial grade sheet plastic. How is a custom or end zone stencil shipped? The 10 mil sheet plastic stencils are folded like bed sheets and shipped in a cardboard container that is approximately 24" x 24" x 6". How do you minimize the curling of the stencil edges? Before you use the stencil, take it out of the box or storage and let it lay flat for a day, this will allow the edges to flatten out. Try to minimize the amount of paint over spray, especially aerosol paints, on the edges. If possible before using the stencil, spray PAM (cooking vegetable oil) on the edges and then rinse with water after use. Once paint has accumulated allow it to dry and flake off as part of the storage process. Prior to the next use spread the stencil out (preferable in the sun) to regain its original shape. How do you layout and set end zone letter stencils? Check out our TuMark end-zone letter layout directions. What procedure should be used to paint a custom stencil logo? When using the custom stencil bring with you a colored picture of the logo. This allows the field painting staff to recognize how the stencil was manufactured relative to the logo features. Many custom stencils will have a border or series of borders. Some of these borders will be cut out using bracing for strength and designated by using a series half moon and rectangular cut outs. Cut the grass as short as possible, this will make for a more clear image and you can use less paint! Prior to taking the stencil to the field we recommend spreading out it to lay flat and remove creases. You want to minimize the amount of time that a custom stencil is spread out on the natural turf to reduce any heat stress to the turf. Use some method to square the stencil on the playing field, using the yard lines and hash marks and string. Once the field stencil has been laid out you must secure the stencil in place using sandbags or other weights - we do not recommend piercing the plastic with anything, such as landscape staples. Try and have all your different colored paint and painting machine available before the stencil is laid out. Have a rinse pail of water available for mistake corrections and clean-out between paint colors. Use an aerosol field marking paint can or spray wand applicator connected a field marking paint sprayer to quickly outline the painted sections of the stencil so the stencil can be removed quickly from the turf. After the stencil has been removed then fill in the respective painted areas. To help a stencil stand out you can first paint a white background. Also you can free hand paint a different color border around the logo. This is especially effective for end zone letter stencils and is really easy to do! For those stadiums with shorter bleachers we recommend placing the stencil on the home field side of center line of the field. More of the stencil will be visible due to the height of football field center relative to the sideline. Keep in mind as you are painting that the stencil is designed to look best from a distance so stand back to get a better perspective! Bring a camera - the logo is going to look great and you are going to want a picture! Send a copy to TruMark so we can admire your work as well! Don’t see your question listed? Give us a call now for answers. Or, sign up for our newsletter to get more free field prep tips.